When Chad and I visit Crystal Spring colony, most of my time is spent working with the guys in the shop, so I relish invitations and opportunities to hang out with the ladies. The whiteboard in the dining room said that the kitchen crew needed help making pierogis for dinner, and when Anita invited me to join her, I accepted with excitement. I knew that pierogis are little dough pockets with filling, and I knew that many eastern European countries and cultures have versions of the dish. 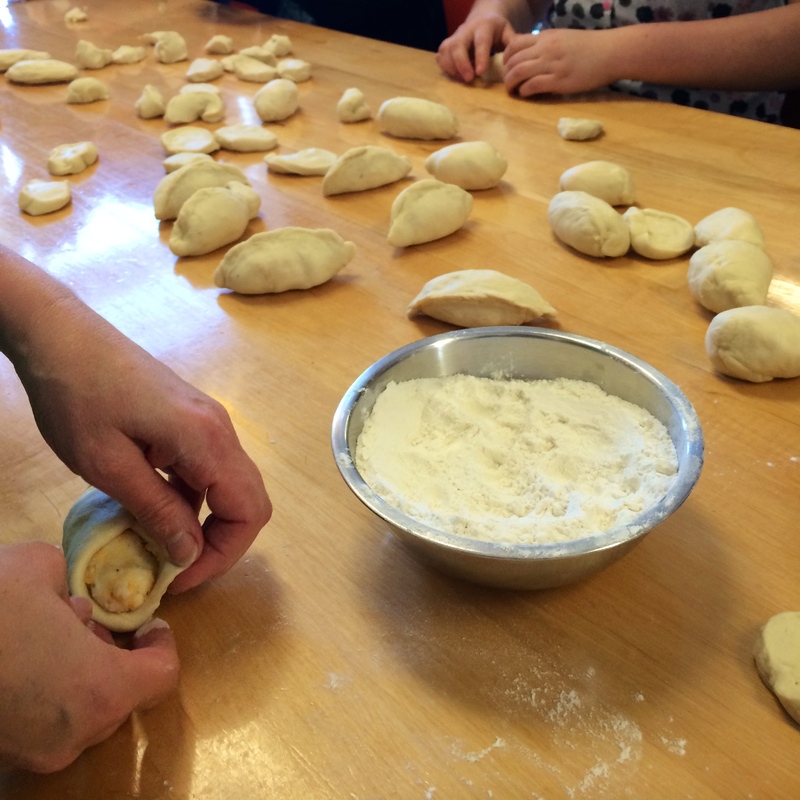 Verenyky, Pelmeni, Koldunai, Maultaschen – different names, but essentially the same concept. 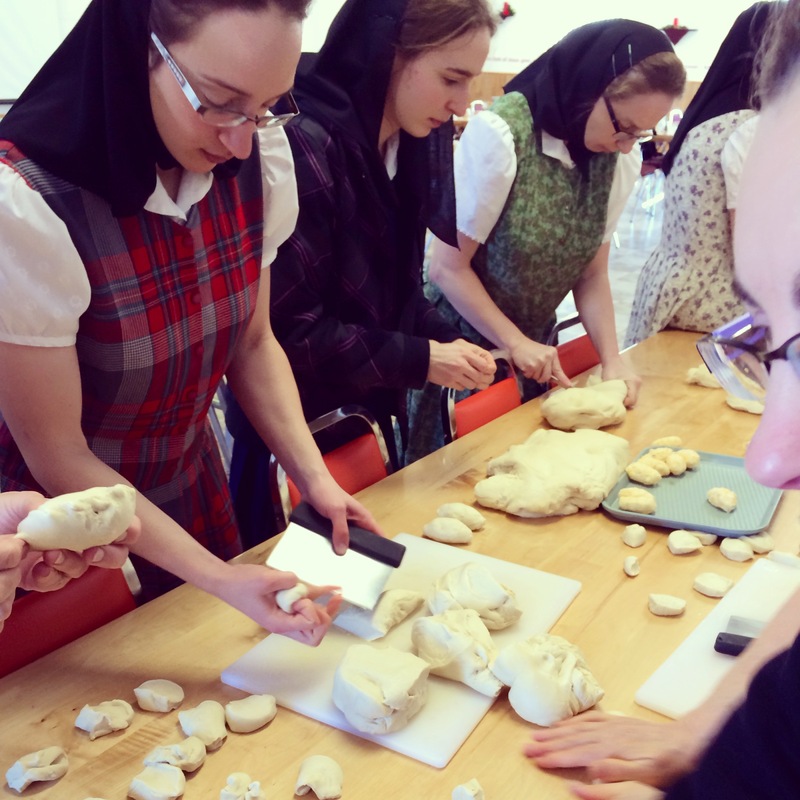 However, I had never actually made pierogis, so I didn’t quite know what I was signing up for. Luckily, the women were more than happy to show me how the assembly-line process works. First step is the filling. Potatoes (that have been boiled), cheese, sour cream, onions, secret seasoning. 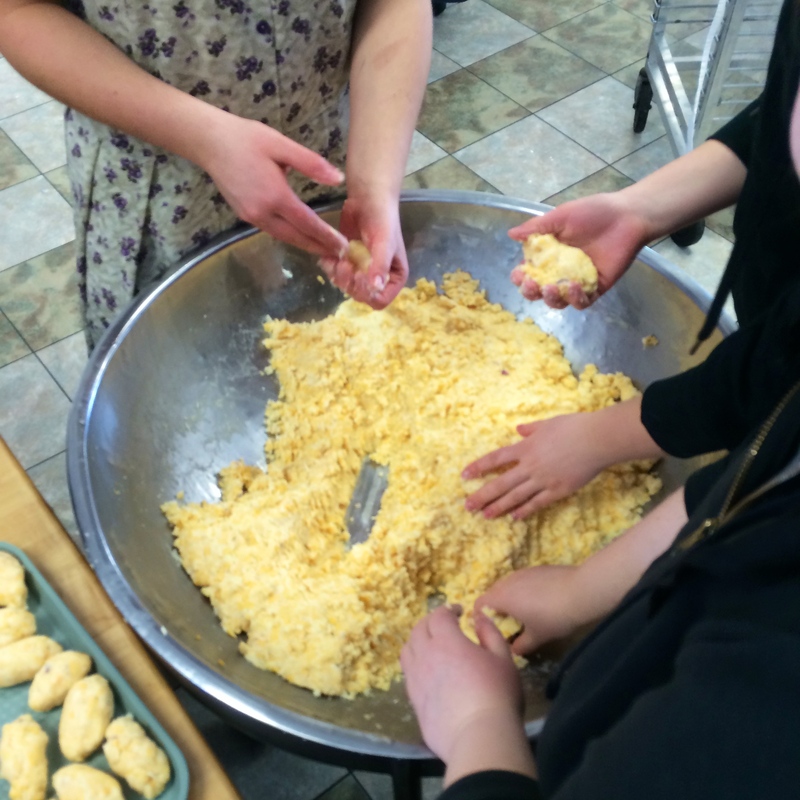 The filling ingredients get all mixed together and formed into little balls. I suppose you could form them however you like, but the football shape seemed to work pretty well. Pierogis can also be stuffed with meat or mushrooms or other ingredients of your liking. The dough comes next. This isn’t any ordinary dough, they explained. It’s similar to a pasta dough, but it’s closer what they use to make spatzle. The dough is rough-cut into equal size pieces, then passed on down the line. Then the dough gets flattened out into circles using strangely colored scary wrinkle hands. No? Just me? Anyway, this was the part that I struggled with the most; I kept poking holes in it. I suppose it’s a skill you learn with practice. 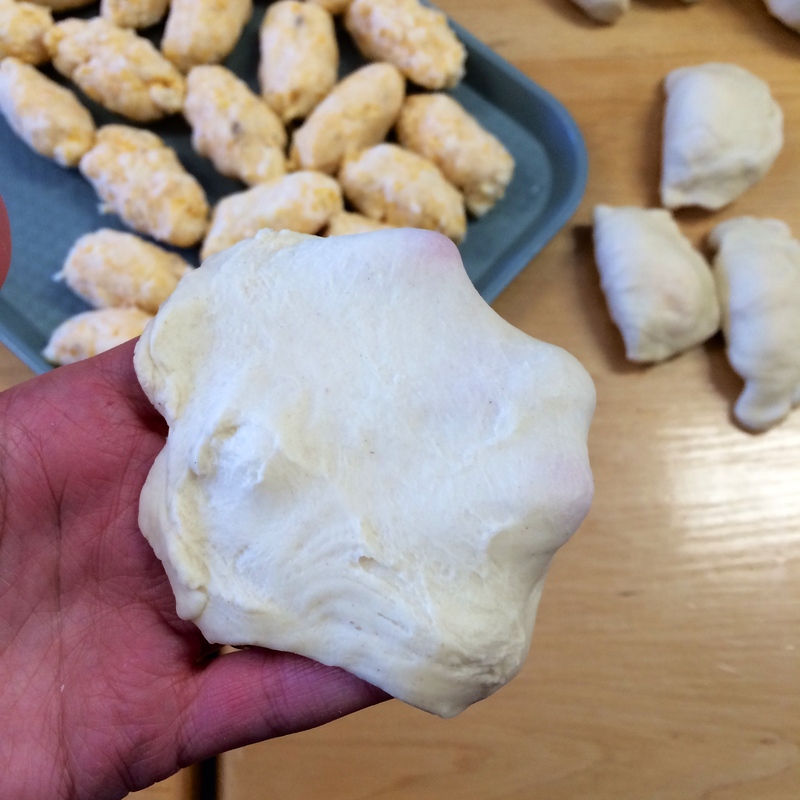 Then the filling gets wrapped in the dough and it all gets pinched shut into a little half-moon pocket. We ended up going into Winnipeg for dinner so I didn’t get to enjoy the fruits of my labor, but pierogi are traditionally served with a a light gravy or sour cream sauce, topped with onions and bacon. Some recipes show just boiling the little pockets, while some boil, then fry, or boil then sautee. Delicious! If you want to make pierogis at home, try one of these recipes. They’re each a bit different, so you can put your own twist on dinner tonight. Enjoy! This entry was posted in Uncategorized on 01.14.14 by awastell.